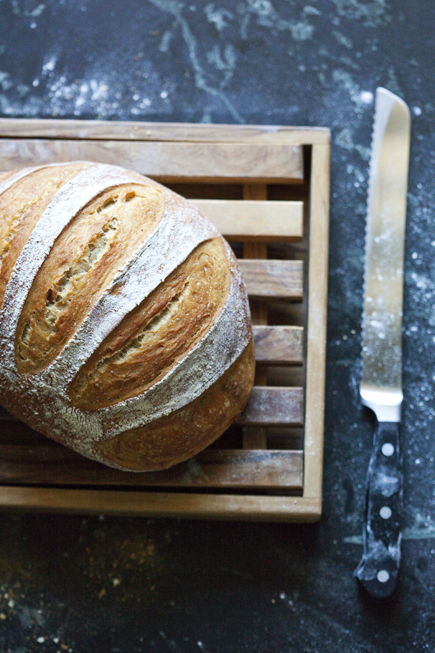 Slashing your dough properly creates a beautiful loaf of bread, but can also help it rise in the oven. If your slashes are not deep enough, the dough may tear open on the top or bottom of the loaf. Leaving you with bread that tastes delicious, but doesn’t live up to its artistic potential. The loaf can also end up being a touch dense if you don’t slash deep enough, because it won’t open up and make way for a dramatic oven spring. So, for the most beautiful crust and best interior crumb, you’ll want to follow these few tricks for slashing. 1. Use a very sharp Serrated Bread Knife. If your knife is dull or is caked with dough, it will pull at the dough instead of cutting through it. I have also successfully used a straight-edged Chef’s Knife, but it is crucial that these style knives be even sharper to get the job done. I have also used a Lame (pronounced lamb) with great results. The key to success with a lame is to make sure the blade is spotlessly clean or the dough will stick. 2. Dust the dough with flour for the easiest cut. The flour helps the knife slide through the dough without sticking. If you use a water or egg wash on the dough it may be a bit stickier, which will make it more difficult to cut. 3. Hold the dough steady with your free hand. In order to keep the dough from moving too much, you will need to support it with your non-cutting hand. This will give you some tension on the surface of the dough to cut against. If your dough is able to move around too much you will just end up dragging it with the knife strokes and it won’t cut easily. 5. Slash depth. Refer to the recipe for the proper depth of the slash for the loaf you are making. If the slash is too shallow you may have a blow out or a tear in the dough. If you don’t get the proper depth on the first pass with the knife, just repeat until it is right. The dough is more resilient than you may think, so you can go over the cut a few times. I’d like to thank my son, Henri, for helping me shoot and edit the video. It takes a village to make this website happen. I am wondering if lactic acid forms when using commercial yeast with a long fridge ferment. I guess I’m really wondering about the different yeasts that are in commercial yeast Vs wild yeast and if wild yeast has more nutritional benefit. I hear so many people say that commercial yeast is not as healthy as wild yeast and that commercial yeast doesn’t slur the same as wild yeast. I love the results that I get from commercial yeast when I use your recipes and techniques. Do you have any info to share? “Fermentation by-products like lactic acid build up through the normal metabolism of commercial yeast, and also through the normal metabolism of wild yeasts and bacteria. That’s why either method, left long enough, will give you dough with that sour effect. But beyond that, in our batches, as the commerical yeast die off, you get some replacement with wild yeast and bacteria that exist in the flour (not much from the air, despite what many people think). I often find water works better for me. I wet the knife then pull it through the dough. Sometimes I use water to prevent dough sticking to the counter or my hands. Sometimes I use water and sometimes I use flour for kneading, depending on the moisture in the dough. I’m careful to not use too much water or the dough slides around on the counter. Thank you for sharing your experience. So glad you’ve found a method that works well for you and I’m sure others will find it useful too. The reason that I ask is because there are so many opinions about commercial yeast and the opinion of many is that wild yeast starters are superior and result in a better product with more health benefits. I know the LAB reduces phytic acid and was recently told that commercial yeast dough does not produce lactic acid. I can’t imagine this to be true since the LAB are already present in the flour. Well, lactobacilli are one of the constituents in natural yeast cultures, and you won’t find them in commercial yeast packets, which are pure saccharomyces (yeast) cultures. But as I say, you’ll get some replacement with bacteria from the flour as our dough ages. Jeff, I chuckled at your response, “But again, I’m making no health claims here, and I think a lot of folks on the web are being a bit wild in this regard. I’m eating this stuff because it’s delicious :-)” I know for myself I can become so caught up in “health claims” that I may get off track with WHY I am baking/cooking in the first place. I know we’ll never have “perfect” in this world. I also know that ANYTHING I bake/cook is infinitely better than that which I can buy. So I thank you for this little “back to reality” response. And I thank you and Zoë for the recipes, this blog, and all your encouragement. Have a truly super day! Yeah– I think the more truthful answer in diet and health is that we just don’t know for sure. The over-clarity is where I don’t want to tread! This thread was was very interesting and I am in total agreement. Sometimes, the very best reason to eat something is simply because it tastes better! My dough must be too wet. When I slash, it just blends back into dough immediately. And my formed boule spills outward during the rest. It doesn’t stay in the tight, formed ball and does not look like the video. I am using KAF all purpose flour, and I increased the water per the suggestion in the book. I am making more dough tonight. I will not increase as suggested and may even add more flour. Too note, my bread does not brown on the stone on the bottom and seems uncooked only at the bottom. I thought maybe it was due to the broiler pan bring placed on the rack under the stone, but maybe it is just because it’s too wet. What do you think? Thank you. The underbaked bottom of your dough is likely due to a baking stone that is not adequately preheated. If you have a thick stone it can take 45 minutes to an hour to thoroughly heat up. I am weighing with a scale and I do preheat for 45 minutes during the rest. I may have miscalculated with the last batch by halving the recipe and adding extra water. When I mixed it tonight with a tad extra flour, again halved, the dough was quite thicker than last time. I added some more water to compensate. Thank you for the video. I will let you know how it goes. I do not have a pizza stone. Can I bake on parchment paper baking sheet with broiler pan with water in it? Which recipe are you talking about, from which of our books (and which page number)? Sure, should be fine. Check out our books or our FAQs page for more. Sometimes when I make a batch of bread (I use the Healthy Bread in 5 master recipe), if the dough has been sitting in the fridge for close to two weeks, it gets very soggy in texture, and slashing the top of the loaf doesn’t really work. It just sort of sinks back into shape. Do you have any recommendations for what to do in this kind of situation? Use more flour on the top. If you really want to address this, you can work more flour in with your hands, then allow to forment at room temp for two hours. If the dough has really gotten dense, this won’t be a good option, but go with a little trial and error. If you really want longer-lasting dough, start a tiny bit drier–a couple T extra flour at the initial mix. Thanks! I’ll give that a shot. Which book are you using (which recipe, what page number)? 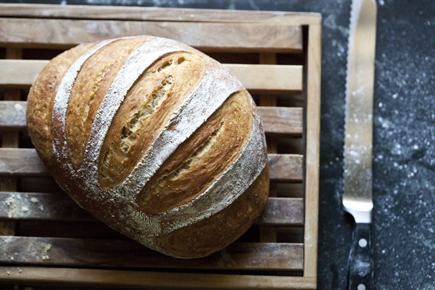 Sorry Jeff – The New Artisan Bread in 5 Minutes a Day (2013) page 53. 4 qt will be just barely enough for the full batch, but it might be OK (have to say I’ve never tried it). Forget the 2 qt! Excellent. Thanks so much for this info! water works very well on your hands for spreading out pizza dough.